Bullets? Those are for sissies. Real heroes use a little girl's innocent laughter to blast the stuffing out of their foes. Sunshine, rainbows, and infectious beats might not be the first things you think of when someone says weapons, but they've all been used in at least one videogame to flick enemy's life switches into the "Dead" position. In Issue 276 of The Escapist, Tim Latshaw says that unconventional weaponry can add character to a game, and if done right, can become a treasured part of gaming canon. 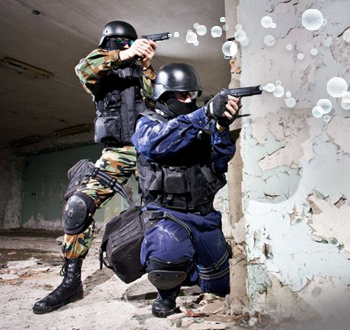 While armed warfare has predominantly leaned toward various ways to lodge pieces of metal in your opponent's body, there is still a whole room in the gaming armory dedicated to objects such as bubbles ... [I]n games, the humble bubble can become a wobbly sphere of concentrated pain, a swarm capable of taking down a player or enemy like a death squad of Scrubbing Bubbles brandishing adorable little switchblades. The most famous of the bubble attacks, however, has to be the Bubble Lead from Mega Man 2. It is a name that has confounded players for more than two decades. Is it "lead" because the bubbles are heavy and travel along the ground or is it simply "lead" as in the slang term for ammunition? Either way, it sounds like Capcom was trying to compensate for something ... Bubble Lead is among the line of quirkier weapons that fail to have much effect on many enemies but to which Dr. Wily loves making himself vulnerable. Does he do it on purpose? If he feels like he has to go down, he'd rather make his enemy have to lob bubbles or spin like a top to do so? It's not just bubbles you have to watch out for. Air can be frakkin' dangerous too, especially if it's coming out of a certain spherical pink protagonist. You can read more about the history of weird weaponry in "Pop! You're Dead."